Like most revolutions, it was a long time coming. In the late 14th century, scholar John Wycliff had overseen the first translation of the Bible into Middle English, sparking a call for Church reform—and a subsequent royal ban on further attempts. Meanwhile, a parallel movement in continental Europe led to partial or full translations of both testaments into French, Italian, Portuguese, Czech, Dutch, and (famously, in 1522) German. By the time the young William Tyndale published his first versions of the Gospel of Matthew, Martin Luther’s Reformation was in full swing. Tyndale’s own education was a combination of high and low influences characteristic of what we would now call the 16th-century English middle class. His family was a prosperous clan of clothiers and landowners enmeshed in the local community of Gloucester—still connected, via trade and travel, to the larger world. As Tyndale’s biographer David Daniell observes, the rich background of dialects that Tyndale must have heard in Gloucester was an excellent incubator for a translator—especially one whose particular gift would be “a knowledge of how ordinary people used language at slightly heightened moments.” It may have taught him two important stylistic lessons: first, that “a neutral word-order and English rather than Latin forms would make something widely comprehensible,” and second, that the short, highly-compressed sentences used to pass on craft-knowledge (“measure twice, cut once,” for example) could make the important moments of a literary text more powerful. Tyndale’s attention to everyday speech was more than literary strategy: it was the logical result of his Reformative ideas about Christianity. Earlier translators had literally not seen English (at least not as a viable vehicle for literature). Constrained by a Catholic idea of language that placed Truth in few hands, scholars had concentrated on esoteric questions that could only be disputed by men of vast institutional learning. But for Tyndale, the core truth of Christ’s teachings was the radical accessibility of the Bible—an accessibility that had been hidden by centuries of Church rule, but which translation could reawaken overnight. As for many reformers, the stories of Moses, David, and the Gospels not only had happened but were happening, here and now. As such, they deserved to be translated into today’s language—a language Tyndale could see had as much potential for elevation as the classics. It is tempting to see Tyndale as a sort of people’s translator, whose unique background and wild talent allowed him to put Word to paper without any help along the way. But the truth is that in the early 16th century the written language of England was still Latin, and the central educational arts the trivium of grammar, rhetoric, and logic. As spoken today, these disciplines sound dusty; but at Oxford, the university from which Tyndale received his Bachelor of Arts in 1512, they were very much alive. They were revered disciplines; mental martial arts whose study rewarded the patient student with an arsenal of specifically tuned techniques. To Tyndale, who was not just patient but brilliant, they gave a sense of proportion and a richer sense of the range of effects that well-made language could have on its audience. Tyndale’s point here (made with characteristic humor and strategically-deployed folksiness) is that after so many generations of cultivation the language of Oxford had become its own subject: a closed-circuit of pin-heads and angels that had nothing to do with Christ’s teachings. The speakers of this language, many of whom were considered the most learned men of their time, “waste their brains about questions and strife of words,” while ignoring the far greater scandal: that the Church’s hoarding of Scripture had transformed a once-great religion into a combination of superstition and gamesmanship—an enervation that looked very similar to the one that Christ had fought. From this point on, the particulars of Tyndale’s life—from where he lived to what he studied to who he worked with—are bent towards the fulfillment of a single project: the transformation of the Bible in England from tool of Church oppression to national spiritual source, a “bright book of life” (as one of Tyndale’s stylistic heirs, D.H. Lawrence, would call Constance Garnett’s Anna Karenina). Despite the fact that it steals its best phrase verbatim from Tyndale’s Mark (“My god, my god, why hast thou forsaken me?”), the KJV version feels very different from its predecessor. The topography of the paragraph has been smoothed out, and the variety leveled by the terraforming Latin influence into a heightened chant that completely changes the effect of the scene. Whereas Tyndale’s steady cam puts us at the cross with the soldiers, waiting to see if Helias will indeed save his son. This difference in effect is also a difference in meaning. Told as it is from its uniformly great height, Christ’s death in the King James Version feels like a fulfillment of fate. It’s a ritual sacrifice, a return to the circle of law, transgression, and appeasement that rules not only the Old Testament, but the Classical tragedies. The king must die. But the Tyndale translation emphasizes the human, rather than the divine side of the crucifixion. Its language is open and contingent and even slightly funny: a tool, instead of an undertow. So the Gospel that it tells is a sort of proto-novel, whose sentences tremble with the possibility of something else happening. That nothing else does happen, and that Christ dies without “Helias” coming to save him, is one of the things that gives the Gospels either their sadness or exultation, depending on your point of view. 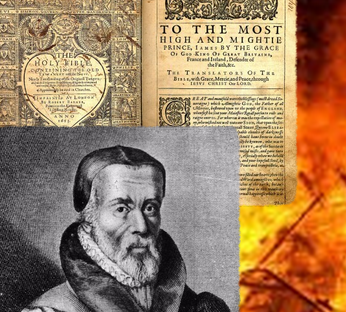 In a similar way, the end of Tyndale’s life could be read as either an inevitable fulfillment of destiny, or an avoidable, and therefore heartbreaking human tragedy. By the time it happened, the uproar over Biblical translation into English had died down significantly. Tyndale’s Gospel had been heralded as a miracle in England and beyond, and King Henry VIII’s position vis-a-vis translation into the vulgate thawed significantly. But Tyndale’s career had earned him many enemies, one of whom—an opportunistic young man named Henry Phillips—managed (more by chance and persistence than skill) to slip into the house where he was staying in Antwerp and arrest him. Within days Tyndale had been sent north, to the castle at Vilvorde, where he stayed as a prisoner for one hundred and thirty five days, writing appeals in the hopes that his sentence might be postponed or changed. But, as Daniel puts it, “None of this would stop the cold machinery of law,” and in October, 1536, Tyndale was executed at last. His work persists—not just on its own, but in the immense influence it has had on English writing and translation over the centuries. From the King James Bible and Shakespeare (neither of which exist without him) to modern writers like Walt Whitman and D.H. Lawrence. His words are literally ours, in the form of phrases so common that we barely recognize them as inventions (“Am I my brother’s keeper?” “The signs of the times.”). His Bible, as he intended, belongs to everyone. That is the miracle.